HP SIM does not use WS-MAN for anything other than ILO or Onboard admin management processor. HP SIM does use WBEM and SNMP as a way of remotely accessing WMI for Windows Server 2003, 2008, 2008r2, 2012 if the WMI Mapper is installed on Windows server. There are several flavors and versions of the WMI Mapper, the one that comes with HP SIM, the one that is separately downloadable as a Windows MSI package from HP. And the ones that seem to be released as updated versions for all of the above. I have found the latest doesn't seem to work as well as the older versions, and the change_logs seem to bare this out as a dependency problem that isn't well explained. Therefore since we use 2008r2 and 2012, I chose to use the [ WMIMapper2_6_0.msi ] package on both the 2008r2 and 2012 versions of Windows servers. 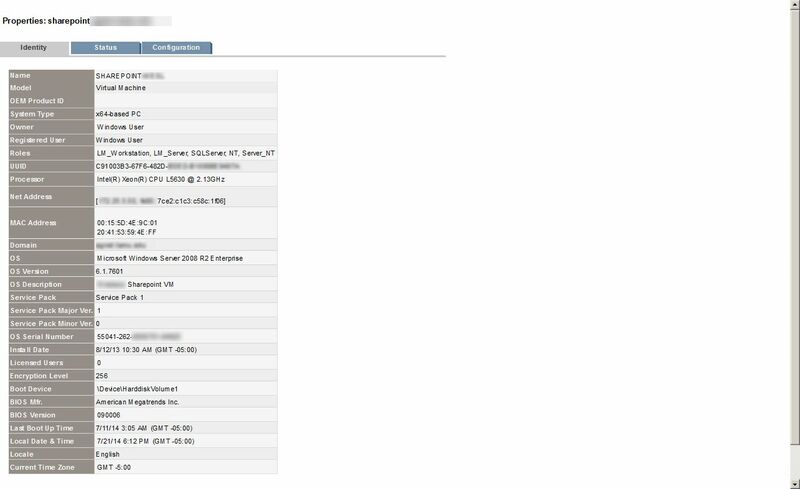 is used to configure a host that has a WBEM (WMI Mapper Proxy) service. In general I believe this is intended not to only map a single Host behind a firewall, but to perform the WMI mapping function for a whole subnet.. but it works just as well for an individual Host. So add the Public or Private IP address through which the "Host to be managed" will be accessed over port 5989. So first the WMIMapper2_6_0.msi packager is copied to the target Hyper-V guest system that is to be managed and installed. Then the Hyper-V guest system Firewall is configured to allow communications on the 5989 default port for WBEM traffic. Then the Hyper-V guest system [Administrative Tools -> Component Services ->][Console Root -> Component Services -> Computers -> My Computer][Rt Click Properties][COM Security][Access Permissions][Edit Limits...][Security Limits -> Add -> domain\user][Permissions [x] Local Access [x] Remote Access] is granted. Then the Hyper-V guest system [Administrative Tools -> Component Services ->][Console Root -> Component Services -> Computers -> My Computer][DCOM Config][Windows Management and Instrumentation][Rt Click Properties][Security][Launch and Activation Permissions][Customize][Edit...][Security -> Add -> domain\user][Permissions for Authenticated Users] [Local Launch [x] Allow][Remote Launch [x] Allow][Local Activation [x] Allow][Remote Activation [x] Allow] is granted. Then the Hyper-V guest system [Administrative Tools ->Computer Management][Service and Applications][Services][WMI Control][Rt Click Properties][Security][Security (button)][Permissions for Authenticated Users][Advanced (button)][Add -> domain\user][Applies to: This namespace and subnamespaces][Permissions][x] Execute Methods [x]Full write [x]Partial Write [x]Provider Write [x]Enable Account [x]Remote Enable [x]Read Security [x]Edit Security is granted. Finally an HP SIM -> Options -> Discovery task is configured, with [Credentials]-> [Advanced Protocols] ->[WBEM] and the domain\user and password are provided which was "granted" access to the DCOM service and the WMI datastore. The reason all of this is necessary and why it works, I believe is because port 5989 is the default port for WBEM traffic as part of a specification, Microsoft already had their version of WBEM called WMI built upon the RPC/DCOM methods supported by the WMI protocol, which unfortunately were not WAN friendly like WBEM.. that is available over a single fixed TCP port. Microsoft RPC/DCOM is based on a moving target range of ports assigned and indexed by an RPC locator service which doesn't exist as part of the WBEM protocol.. and in fact fixing it tends to break certain features. So a true WBEM protocol Mapper called rather unintuitively a "WMI Mapper" translates true WBEM protocol port calls into local WMI Mapper calls to the WMI service on the Host and back again. In theory the WMI Mapper can also act as a gateway to other machines on the same subnet.. but this seem to run aground when dealing with local LAN complexities of remote invocation of RPC calls and default security.. which is what the last three steps are all about.. enabling a "Domain" wide user account permission to use the Remote Procedure calls through DCOM to access the WMI data store.. and finally granting access to that data store. WS-MAN was to be a replacement for all of this and more closely align Microsoft WMI with WBEM, however HP SIM is a project that developes over time and ceases development periodically then resumes (except it is now scheduled to be retired in a couple of years).. and only used WS-MAN (the official RFC version) for managing some of their equipment, but not all operating systems.. so while WS-MAN is supported for HP equipment it is not for Microsoft operating systems. Thus the best, only way to remotely manage a Microsoft operating system without Insight SNMP agents, or WBEM agents written by HP, for example on a Hyper-V virtual machine with no native HP SIM agents or "supported" WBEM capability.. is to install the HP SIM WMI Mapper package and add that as a WBEM proxy to get to the native WMI source on a virtual machine guest Host. When its all done, HP SIM detects all that it needs to manage a Hyper-V virtual machine guest running Windows 2008r2 or Windows 2012 and properly recognizes it is of type "virtual machine" and is indeed a "virtual machine guest". Another plus is that while you can "try" to install Insight SNMP agents on a virtual machine it will halt and not complete complaining "install not supported on virtual machine guests". The WMI Mapper package however does install on a virtual machine, probably because installing the WMI Mapper on a SIM Host is supported on a virtual platform. 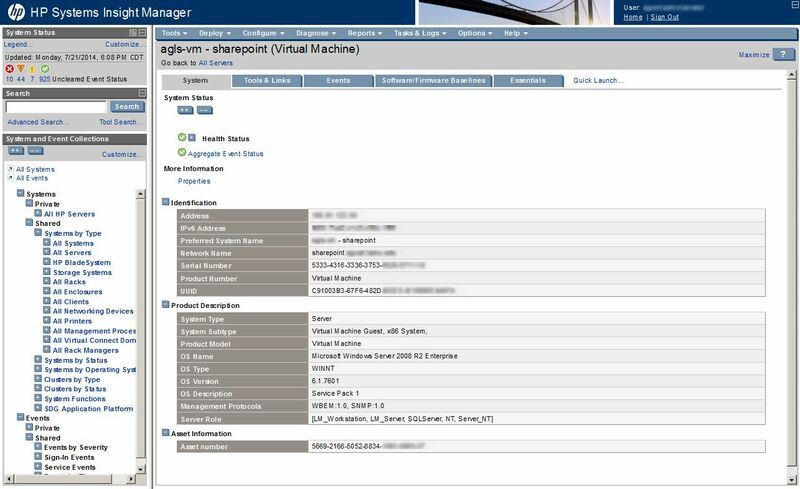 More Information includes additional details sourced from the WMI CIMOM datastore, status and configuration tabs appear to perform live inquiries directed at the virtual machine on command.